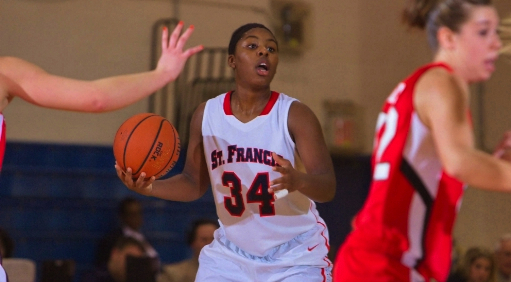 The St. Francis Brooklyn Women’s Basketball team beat Cornell University 78-68 on Nov. 8, 2013. This is the third consecutive win that the Terriers have locked down. They are now 7-2 on the season. Jaymee Veney has been an integral factor in the team’s successes so far this season. She scored 15 points and nabbed six rebounds for the Terriers against Cornell. Following Veney were Sarah Benedetti and Eilidh Simpson. Both had 14 points each, with Benedetti’s occurring in the first half of game play. Leah Fechko, an SFBK superstar, didn’t score until the second half of game play, but finished with 13 points. Fechko shot 100% from the charity stripe. Junior point guard, Katie Fox, scored a personal best of 12 points, nine of which came from behind the arc. Throughout the whole first half of game play, SFBK and Cornell struggled for power. SFBK finished the half on top, closing it out with a 22-12 run, leading Cornell 43-33. The second half was also a tug of war between both teams. Cornell cut the deficit to 52-44 after a 17-7 run which was extended from the ending buzzer of the first half. SFBK shot over 50% from the field and 90% from the free throw line. They shot a season-high 63% from beyond the arc. The Terriers return to the Pope Physical Education Center on Dec. 20, 2013 to play the Lafayette College Leopards.